I will be receiving a copy of Traci L. Slatton's Immortal soon, so for the moment, please enjoy the following interview with Traci! 1. Tell us about your book, Immortal. Immortal is a rags-to-riches-to-burnt-at-the-stake story. It’s a journey of spirit and an education of the heart. That said, it’s the story of a mysteriously gifted street urchin who undergoes the darkest moments possible and still goes on to find true love, deep friendship, hope, faith, and ultimately the deepest secrets of his origins. 2. Why did you write this book? I love to tell stories! I was working on a non-fiction book about science and spirituality. (Piercing Time & Space, ARE Press, Virginia Beach, VA: 2005.) It was fascinating research, but I found myself longing to write fiction, to create characters and wrap myself around adventure, conflict, and obstacle. Story lust drove me. 3. The book takes place in Florence during the Renaissance: What inspired you to choose this setting? This goes back to the previous question. Renaissance Florence is a character in this novel--it’s inextricably interwoven into the story. It’s why I wrote THIS book. More explicitly, I am married to Sabin Howard, who is one of the foremost classical figurative sculptors working today. (www.sabinhoward.com) Think Michelangelo’s work: that’s what my husband’s work resembles. Moreover, Sabin is half-Italian; his mother is from Torino and he is completely fluent in the language. So, for him, Renaissance Italy is alive and well. It’s a part of our everyday discourse. I was always interested in Renaissance art but it’s become a passion because of living with Sabin. Also, Florence between 1300 and 1500 was an intense and extraordinary place, almost unequaled in history. Art, philosophy, learning, commerce, banking, and government were all burgeoning and concentrated into this small city, making it the center of Europe. Out of Florence radiated invention and innovation. One of the popes called it “The fifth element of the universe.” Only Paris between the two world wars comes close to the fervor of creativity that was taking place in Florence during the Renaissance. It’s a powerful time to write about. 4. How did you come up with a protagonist like Luca? I wanted a character who would meet and make an impression on my two great Renaissance heroes: Giotto and Leonardo. This character had to be the kind of man who could inspire love, lust, envy, admiration, and riveting hatred in other people. And he was going to face terrible challenges, so he had to have personal resources to help him through. And his suffering would make him humble and give him a hunger to love and be loved. 5. Lucas plays many different roles – orphan, companion, healer - throughout the story, which do you personally relate best to? Perhaps to the healer and the companion. I was a hands-on or spiritual healer for many years, and Luca gets to do what I always longed to do: lay hands on and cure someone completely, even bring a dying man back to life. I have four daughters, and in the best moments of parenting, there is a companionable aspect to it. There are moments when all the little stuff falls away, all the blah-blah-blah about messy bedrooms and parties and grades and allowances and health concerns, and my children and I are friends, laughing together. Even my little one, who is 3, sometimes sits and chats with me as if we were two good buddies. I treasure those moments. 6. Luca meets da Vinci, Botticelli…“immortals” whose impact on society is still apparent. Can you talk to us about some of those figures, and the way they still shape modern society? The great artists like Leonardo and Botticelli left us ideals of beauty that are still unparalleled. Leonardo left behind a prototype of a polymath genius as the highest aspiration. 7. Part of what makes Luca’s story so beautiful is the time period it is set in and the people he encounters. Do you think it would have had the same significance had it been placed at another time, such as the present? 8. Luca witnesses many important historical events throughout his life. What kind of research did you conduct for these? I read a million books (okay, maybe a hundred), searched on-line, spoke with friends and relatives with extensive historical knowledge (my husband is a Renaissance sculptor and my father-in-law is a history teacher with a PhD), and I corresponded with, or spoke to, a couple of professors. I also like the History channel for shows on history! And we visited Italy several times, spending much time in the Medici chapel in Florence and the Pinacoteca Vaticano in Rome. No one but me is to blame for inaccuracies, distortions, and out right fallacies. 9. What are your future writing plans in writing? I am working on the sequel to Immortal right now. 10. Any advice you could give to beginning novelists out there? Persist! And know who to trust with your work. 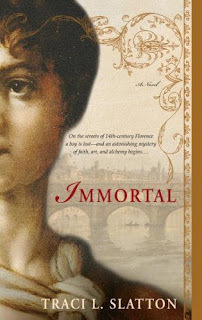 If you are interested in finding out more about Traci L. Slatton and her book Immortal, you can visit her website at www.tracilslatton.com.